The Batman has always been a mixed bag of pleasure for me. There are so many episodes that hit-and-miss and the introduction of Batgirl in season three brought me new hope that it could turn around. After the excellent opening of “Batgirl Begins”, I knew the show was capable of entertaining stories, characters and great animation. Unfortunately, most of season three became rather forgettable halfway through and none of the episodes, to this day, stick with me. That’s not to say season three of The Batman is completely mediocre. It opens strong and with a bang, but closes with silence, as the later half of the season doesn’t do too much to impress. Still, for the fan of Batman it’s worth watching, however forgettable some of the adventures he (and Batgirl) have are; there are highlights, such as the two part “Batgirl Begins”, “I Am the Night” and “Gotham’s Ultimate Criminal Mastermind” but overall there just isn’t much to take a peak at this season. One thing is for sure though—while the stories may lack, the animation does not. I’m continually surprised by how downright awesome the animation on this show is. Fights always come off looking simply beautiful and are a much bigger treat than the story itself (this season, anyway). The races in “RPM”, in particular, are just beautiful. Overall the third season of The Batman is very hit-and-miss. Some love it, some hate it (still) and some just are like me who didn’t go in any particular direction but still didn’t really find the whole thing interesting. Presented in the same manner that past seasons of The Batman were, this season matches the others perfectly. Packaging is similar and the disc art is very similar (downright identical, really), but I’m still pleased with it. On top of the two discs we get an insert detailing what’s on each disc—oh how I love the inserts! They make the package feel more worth your money for some reason when you see a little something extra stashed away in the corner. Menus are static with music over the main menu only. The main menu is shockingly sparse this time around on the first disc, with only “Play” and “Episodes” options (the second disc throws in “Special Features”). Beyond that there’s not too much to see here—disc art matches the series and unlike other DC animated sets, the characters at least appear in this season! Video and audio for this release are, like past releases, very nice. Audio is nice and strong, while the video still packs a fair amount of aliasing in. Some of the image appears soft at times (“Brawn” in particular), but overall it’s a satisfying transfer of The Batman’s third season. Special features are no longer a disappointment this time around! Unlike last season’s completely useless episode recap “feature”, this season has interviews with crew and cast that discuss their motives and thoughts behind the season. We hear from the usual crew (Capizzi, Matsuda, etc. ), but it was cool to see and hear from Danielle Judovits speak a bit on her role as Batgirl. The featurette was short (slightly under ten minutes), but I think it was just the right amount of time spent. If we could get these on future season releases, I’ll be extremely happy—here’s hoping! 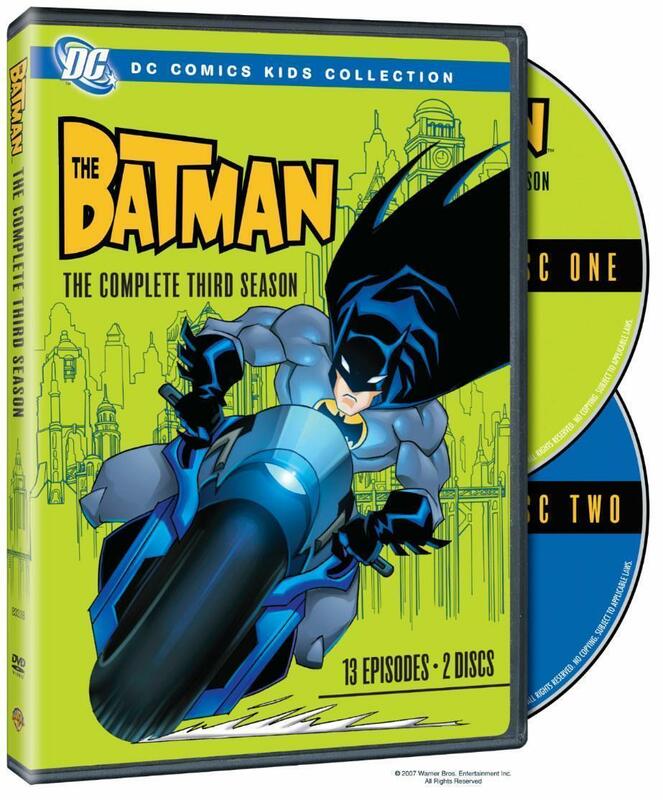 Overall The Batman: The Complete Third Season is really hard to review. If you’re a fan, completist or simply loved the third season, the set is a no brainer to buy. For those that are unsure, you may want to give it a rental first—although you’re more likely to spend more on renting each disc than you would be to just outright buy it the first week of its release. As a season I can’t really recommend it, but as a DVD set it’s satisfactory and worth what little it costs, so in that respect I’d call this set definitely Recommended. The third season of Teen Titans is where I slowly began disliking the show more. I think it had to do with the fact the shows formula rarely changed and we were being bombarded so much with constant airings on Cartoon Network and Titans in the media everywhere else. Of course after watching this season again, I can definitely say I was too harsh on it at first. While the overall Brother Blood (incorrectly billed as “Blood Brother” on the DVDs rear description) arc was disappointing to me, the one-shot episodes such as “X”, “Haunted”, “Revolution”, “Can I Keep Him?” and “Bunny Raven or…” are so thoroughly enjoyable, I don’t know why I wrote this season off as much as I have in the past. There’s a ton of fun episodes to be had on this set and watching them all back to back make for a much more enjoyable experience than the stunted way we were given them originally. With it’s superb animation, fight choreography and great story telling (for the most part), Teen Titan’s third season is simply pure, unadulterated fun to watch. If you haven’t seen the episodes by now, then do yourself a favor—you’re missing out otherwise. Dual disc amaray case coupled with a paper insert detailing the contents of each disc are what we first lay our eyes on when opening the set. Oddly enough we have Speedy and Bumble Bee on the disc art rather than any of the Titans—a welcome change, to be sure! Menus are static and sparse, with music playing only over the main menu. Menus are definitely a step down from past sets, but are still pleasing to the eye…plus there are no convoluted fancy menu animations to sit through. Video and audio on this set are extremely tight as well. Video does have its fair share of aliasing and interlacing issues, but it’s nothing we haven’t seen on past sets. Sound quality is strong and sharp and gives a decent rumble or two for being only a Dolby Stereo track. The special feature on this set may worry you at first with it’s name, but don’t fret—while it’s not a season recap like we got on The Batman’s third season set, we did get a healthy villain recap. Seven villains total, ranging from Slade all the way to Mad Mod, we’re given details on who each of these villains are and their parts, rolls and inspirations on the series. We hear from Slack, Murakami, Wolfram, Hoegee and [Andrea] Romano about their thoughts and inspirations for the series. Romano mainly chimes in when talking about Perlman’s superb voice acting (something I’ll always agree with…except maybe his Killer Croc in The Batman. I can take or leave that performance) and also Malcolm McDowell’s performance as Mad Mod. The special feature runs a near fifteen minutes in length and is lightyears better than what we got on the past season set (a mere episode recap). Overall this season set packs in thirteen entertaining episodes and tops them off with a light special feature that runs just long enough for a two-disc set. Whether you’re a Titans fan or just a DC Comics fan, do yourself a favor and pick up this set, it comes Highly Recommended. Both third seasons of The Batman and Teen Titans will be available on DVD April 10th.